A train has derailed in Assam, India, seriously injuring its driver and causing minor injuries to some passengers. The accident occurred as the train was about to cross a bridge. The accident in Kokrajhar district occurred between Salakati and Basugaon at 5:15 a.m. local time Saturday, according to Northeast Frontier Railway spokesman Jayamta Sarma, as cited by India Today. Officials said the train was running at a slow speed when the derailment happened, which is why there were not more serious injuries or deaths. 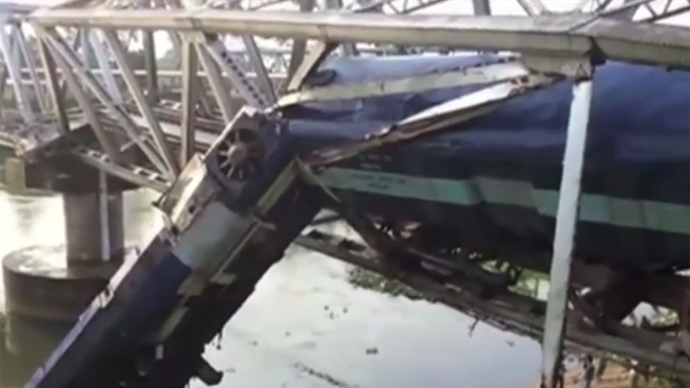 Footage from Ruptly shows the aftermath of the derailment, part of the train hanging from a bridge into the water below. Some passengers are seen walking from the train, one man with a makeshift sling around his right arm. The bridge's metal is also shown bent and destroyed. The driver was admitted to the hospital, while some passengers were given first aid, Sarma said. The train runs from Alipurduar in north Bengal to Guwahati in Assam. Authorities are working to restore rail traffic which has been hit because of the accident.